Adventure21 - Canyoning Cumbria, Coniston, Ambleside, Keswick, Eskdale, Rydal, Bowness, The Lake District, Lancashire and Greater Manchester. What do i need to know about raft building? What do i need to know about sailing? What do i need to know about rifle shooting? What do i need to know about tyrolean traversing? What do i need to know about walking? This has got to be one of the best extreme fun adrenaline activities around. If you haven't tried canyoning before, you're in for a real adrenaline adventure. is a mixture of sliding, swimming, climbing, jumping down waterfalls, jumping off cliffs and high banks into deep plunge pools. Its a real adrenalin rush. The session starts with a short gorge scramble up to the canyoning venues and then the fun really starts. We have a number of canyoning venues available, including one in the Coniston area of the Lake District, one in the Ambleside area and another in Eskdale. Give us a call and we will describe them all to you and work out which one will suit you or your group the best. Whats the difference between canyoning and gorge scrambling??? Well its going down the gorge, instead of climbing up so its mainly jumps and slides into deep pools and its a little more extreme and a real adrenalin rush! Our instructors will give you all the help and encouragement you need to get you through. Canyoning is the ultimate adrenalin rush! there really is something for everyone in your group so if the big jumps are a little too much then there are always smaller options. Esk Gorge venue Cumbria, Lake District. I called Kety just before the bank holiday weekend for a last-minute canyoning session for two people. Luckily for us, Dave was able to squeeze us in for a 3-hour session on Church Beck, which runs down the Coppermines Valley above the village of Coniston. Dave has a lockup full of kit next to the lake and a separate unit for private changing. During a 15-minute walk up to the gorge Dave made us feel at ease, and once we started the activity he made it fun but with a real sense of security. He encouraged Camila to step outside her comfort zone, which meant that she got the most out of the activity. He was extremely patient at the big jump, which allowed her to build her confidence. We had a fantastic start to our weekend getaway. Dave took loads of photos and shared them very quickly to his Facebook group - which made the weekend even more memorable. Dave was the consummate professional throughout, and I would happily recommend him for both private instruction and group activities. 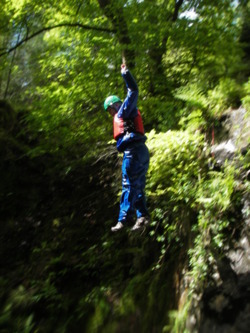 rock climbing, mountain and hill scrambles, abseiling, aquaseiling, open Canadian canoeing, canoe sailing, canyoning, cycling, gorge scrambling, kayaking, mountain biking, sailing, knot tying, Pontoon and rope bridge building, ghyll scrambling, waterfall climbing, orienteering, navigation, hill walking, archery, rifle shooting, Paint balling, raft building, team building, survival days, culvert scrambling, Tyrolean traversing fishing, bushcraft day courses, and bushcraft and wilderness camps. We have a fantsatic canyoning venue's within easy reach of the North Lake District, South Lake District, East Lake District and the West Lake District areas and easy road links from the following places, Coniston, Ambleside, Windermere, Keswick, Hawkshead, Kendal, Bowness, and Ullswater. we find that Canyoning is one of our most popular adventure activity for stag and hen parties. To view some of our Cumbria canyoning pictures please click here canyoning images.